Maxpro Digital voice recorders will EXPAND YOUR MEMORY. This tiny device will change your life. your ability to capture great ideas as they come to you, capture conversations, meetings, discussions, verbal business agreements lectures and any other aural record you need . This voice recorder is digital, compact, unobtrusive and simple to operate - Its 100% Brand New High Quality - Clear Voice Recording - Memory : 8GB - Easy Use, Plug in and Play, No Drives Needed Support U Disk Function - Charging Time: 2 Hours. Working Time: 16 hours on one Charge. Can store up to 100 hours of audio - Charging: Connect the USB interface to computer. Fitted with a Lithium-ion battery - One Button Recording: Push the Power Button to "ON" Position. Stop Recording: Push the Button to "OFF" position or Connect it to the Computer - Audio output: playback through the computer: Connect the USB Recorder to the Computer. Upload the Recording files and playback in your Computer - Recording is in standard WAV format which will easily play back just by double-clicking the files in windows. Compatible with all versions of Windows, ME, LINUX, XP Operational systems - This 8GB flash drive is a digital voice recorder. it doubles as a standard USB key as well - Enjoy - Please click on the ADD TO CART button now to place your order. Some users may need to download VLC MEDIA PLAYER, its free to download, here,s how. 1. Search "VLC Player from Google, 2. Choose the correct player for your operating system, and download it (it's free) 3. Drag the VLC icon to your application folder. 4. Once your VLC player is installed, open up your WAV files from your recorder, it should give you the option to "open with". Choose to open with your VLC player, or simply drag the WAV files into the VLC player. 5. After you have done the above.Turn up the volume on your computer, now you're able to hear recordings 6. To convert the WAV files to different format use - File Converter. MAXPRO - Digital Voice Recorders expand your memory. This tiny device will change your life. your ability to capture great ideas as they come to you, capture conversations, meetings, discussions, verbal business agreements lectures and any other aural record you need. Its compatible with Windows, ME, LINUX, XP Operational systems. This device is NOT MAC compatible. 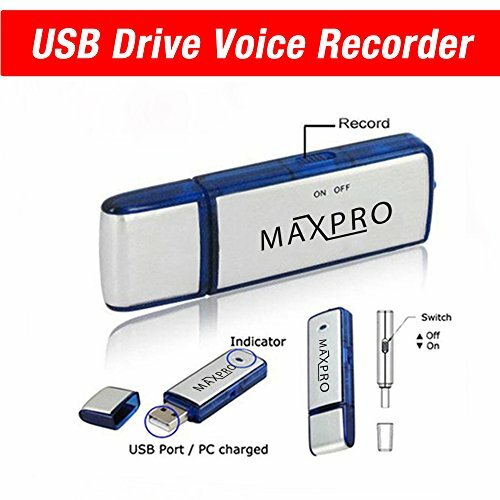 MAXPRO - Digital Voice Recorders with one button recording: Push the Power Button to "ON" Position - Stop Recording: Push the Button to "OFF" position - Audio output: playback through the computer: Connect the USB Recorder to the Computer. Upload the Recording files and playback in your Computer - Recording is in standard WAV format which will easily play back just by double-clicking the files in windows. MAXPRO - Digital Voice recorders come with ONE YEAR WARRANTY - We are very confident in giving 1 year warranty for this product as our Quality Control is an area we put a great deal of time and effort into. We very much aim to please. So enjoy this product and PLEASE click on the ADD TO CART button now to place your order. If you have any questions about this product by MAXPRO, contact us by completing and submitting the form below. If you are looking for a specif part number, please include it with your message.